In Psalms 19- The Bible depicts the sun having an orbit within the heavens. At one time this used to be dismissed as the sun orbiting the earth, but in light of the context of the scripture it can clearly be shown as a recent scientific fact. It moves from one end of the galaxy to the other. Psalms 19.1 – The heavens declare the glory of God; and the firmament sheweth his handywork. Keep in mind the entire context is described from a heavenly point of view, and describing the events in place from space. Verse 4 says that in ‘them’ meaning that in the heavens (space) God made a tabernacle (tent or dwelling place) for the sun. The next two verses are based on verse 4 as the reference point, and is stating that the sun runs its race from one end of the heavens to the other. Astronomers have estimated the sun would take 226 million years to complete one revolution around the center of the Milky Way. 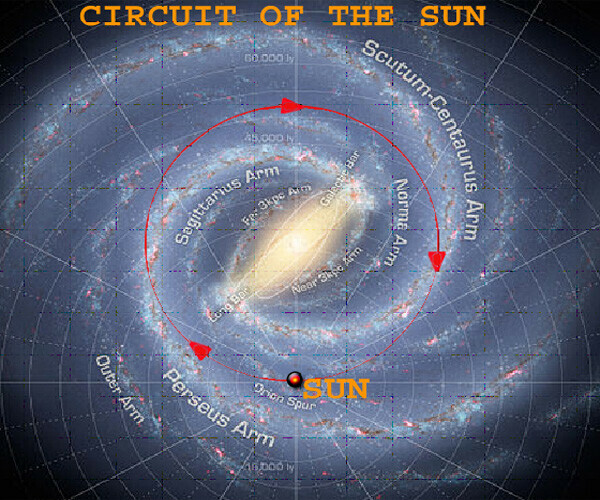 The sun is 26,000 light years away from the center of the Milky Way, traveling at a speed of 782,000 km/ hr in its circular orbit. The Milky Way has been determined by astronomers to be a barred spiral galaxy that is 100,000 light years at its maximum diameter with a thickness of 1000 light years. Taking in consideration that our sun is 30% away from the center of the galaxy, and taking the facts from astronomy a parallel could be concluded from what we observe that our suns radiation would reach nearly everything in this ‘layer’ or heaven (as the bible depicts the heavens or space in different layers) meaning our galaxy, and thus validating the second part of verse 6 that nothing is hidden from its heat.